The second round of the ‘Kinesis UK London and South East Cyclo Cross League’ of the 2018/19 season was held at Crystal Palace, south London organised by London Phoenix on September 16. Crystal Palace had been a ‘Lost Cyclo Cross Course’ since the mid 1980’s and therefore it was a very welcome return because the venue rates very highly in cyclo cross folklore having hosted the 1973 World and many London Championships. One of the trends why we have lost almost 100 courses in the London and surrounding area is because organisers faced resistance from local authorities or other landowners due to a lack of understanding of cyclo cross. Or they have little interest in hosting events in addition to a small but vocal hostility from other users (So often from dog walkers). Event organisers Caroline and Max of London Phoenix approached Bromley Council after hearing that Paul Maunder (Rainbows in the Mud) had received a receptive attitude from Bromley as he continues his work to host a possible World Cup in London. Previously and only a few years ago Addiscombe Cycling Club had received a very frosty reception when they made enquiries. The action was held on what was once the formal gardens of the Italian Terraces and where there are now TV/Radio masts was once the site of the now lost Crystal Palace. What we saw at ‘Palace’ on September 16 not only showed our sport in a good light it also did the same for the wonderful Crystal Palace. 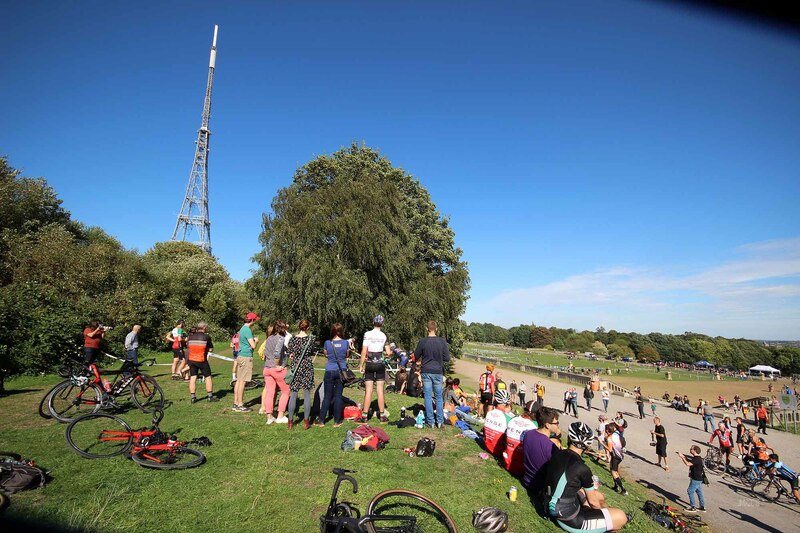 The successful return of cyclo cross to Crystal Palace illustrates that at the heart of any international success (Such as the three big tour won by British riders in 2018) are regional events, these are the foundation stones of our sport where people and clubs work selflessly to create friendly gateways into cyclesport. ‘Old fashioned’ club structures underpin our sport – bringing people together to organise events not for profit. Huge thanks to London Phoenix CC, Brixton Cycles, Herne Hill Youth CC, Vicious Velo, Dulwich Paragon, Bromley Council, Crystal Palace Park, Canopy Beer, The LCCA, the comm’s Stuart and Sarah and the results team. Pictured below are a few pictures from the latest action at Crystal Palace plus links to a full album and video. In regard to pictures I seem to be concentrating less on pixel perfect action shots and more on atmosphere.